Oops - we don't appear to have a video for the DocuMate 3460. The DocuMate 3460 is a high speed and technologically advance DocuMate and the easiest to use scanner among its competitors. It is packed with features that will change how you look at and manage paper documents and information. The DocuMate 3460 is powered by Visioneer OneTouch® technology to scan documents to up to 9 preset, yet completely configurable destinations. This enables your document to be scanned with the proper settings for resolution, color, duplex, auto-crop, auto-straighten, file format and then delivered to virtually any application, folder or device – in one touch of a button! Integrated with Kofax® VRS™ (Virtual ReScan®) technology, imagine the workflow possibilities of delivering perfect scanned paper documents in a searchable PDF format to email or Microsoft SharePoint® or a custom web application for your enterprise, all at the touch of a button. Not only is this a productivity gain but greatly reduces the training requirements for scanner users, further helping your return on investment. You don't always know what documents you will need to scan next – you might have clean laser quality pages today but tomorrow there maybe multi-colored forms, embossed ID cards, varying sizes of paper. The DocuMate 3460 handles it all. 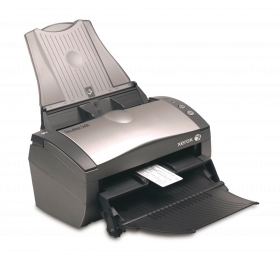 The 50-page automatic document feeder (ADF) makes short work out of any stack of paper of varying size. The front feed tray on the DocuMate 3460 handles scanning plastic cards, such as driving licences, not only increasing the card scanning efficiency, but drastically improving roller wear, making it an extremely cost-effective solution. Work Smarter Smart Ultrasonic Double Feed Detection is built into the Documate 3460 so that you'll never miss a page due to a misfeed or a stapled document going through the scanner. Kofax VRS is integrated into the scanner driver so that you get perfect scans from imperfect originals. VRS also eliminates the need to rescan documents through automatic cropping, straightening, brightness control and edge clean-up. All this is also integrated into Visioneer OneTouch so your entire scanning requirements are achieved at the touch of a button. In the end, paper becomes information and flows through the organization under your control.